Haven't written in a while what with one thing and the other but I've a few questions. Question 1: I have been running Power Compacts (2 10,000 K daylights and 2 Actinics along with blue LED's) on my 125 gallon (6 foot) reef tank for years with no issues however, the colors of corals I can keep seem to be limited to green or tan and random purples. or to the fact that I have a double barrier between the lighting and the tank (moisture protecting plastic strip below lights and a glass canopy on tank to reduce evaporation). would it make sense to remove one or both of those barriers? 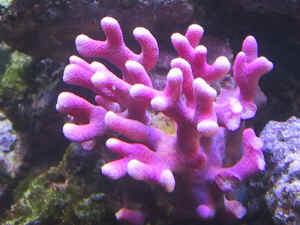 Question 2: I have an elegance coral who appears to be doing quite well but I have questions related to its feeding. I currently feed a little bit of whatever I am feeding the fish. This could be Formula 1, Formula 2, Plankton, Marine Cuisine, etc.., quite varied and something different every day but not much of it. I thought that this would be a bit more along the lines of how they eat in their natural environment but noticed in your posts frequent suggestions for larger, meatier feedings twice a week or so. Since I do maintain a high organic load (no skimming and very little true filtration, just random water movement), and since it does appear to be doing fine, should I just continue my current practice? I do 30% water changes every 3 weeks or so and am not concerned with over feeding so much. The elegance, along with the Wellsophyllia, Acans, anemones, and Favia, appear to eat everything I give them and never regurgitate so I thought I was doing ok.
Alk: 9 to 11 dKH (I do have to buffer every week or so). Thanks as always for your advice and work.